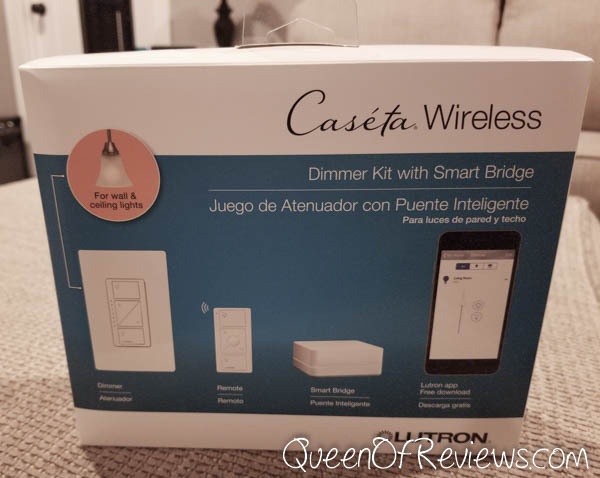 Caséta Wireless is made up of dimmers, a remote control, a bridge, and an app that integrate seamlessly into many connected home solutions. Dimmers are available for wall and ceiling lights as well as table and floor lamps. The easiest way to get started is with one of their starter kits and then add on components as needed. We chose the Wall and Ceiling Light Starter Kit which comes with one dimmer switch with wall plate, remote, Smart Bridge and the free Lutron App. If you do not want smart phone access the switch can still be used by itself and also with the remote, but the app adds so many features you really do not want to miss out on it. Installing the switch is very similar to any other light switch. First make absolutely sure that your breaker is off. Remove the switch plate and then the two screws for the old switch. Pull the switch away from the wall and disconnect the wires from the old switch. The Caséta Starter Kit includes wire nuts to attach the wires from the new switch to your wiring. Also the Starter Kit includes a very easy to use quick start guide with pictures and everything. Once you have the wires connected attach the dimmer switch to the junction box using the provided screws and attach the new switch plate. Turn on the breaker and begin playing with your new toy. 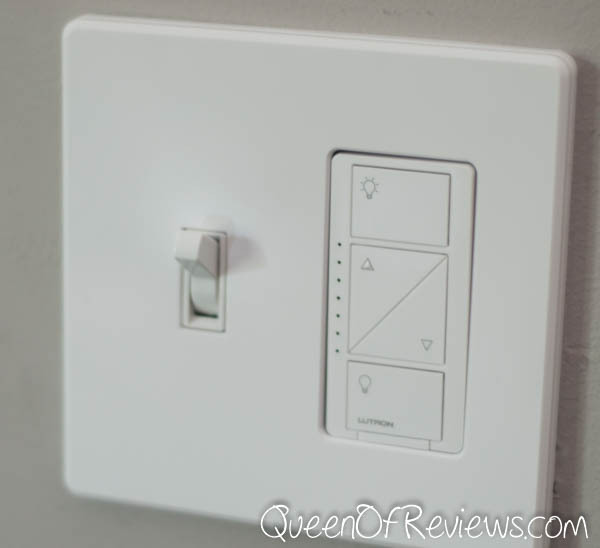 Once installed the dimmer switch is so easy to use, press the top button to turn on full brightness, bottom button turns it off and the up and down buttons in the middle adjust the brightness. The Smart Bridge comes with everything you need to install it, just plug in the power and the provided ethernet cable to an available port on your router. Download the app and open it and it will begin searching your network for the Smart Bridge. Once the app is connected to the Smart Bridge you can adjust the lighting controls as you see above. This is also where all of the “connected” magic happens. We have Nest thermostats so we connected the Nest App to the Caséta app so we can see the current status of the thermostats within the app and you can also do cool things like use the Nest to tell Caséta when you have left the house or are arriving home and the Caséta app can turn your lights off and on accordingly. Another feature that we really love about the app is the ability to create “Scenes” which are like presets. As you can see above we have a “Scene” for watching a movie which turns the lights off, the “Chilling” Scene my husband created sets the lights to a nice, warm 50% great for just hanging out. So let’s talk about what all Caséta integrates with other than Nest mentioned above. Caséta also works with Honeywell, Lutron, Ecobee and Carrier thermostats as well as Serena Shades. Can you imagine lowering the shades and turning the lights on automatically? Then when the sun comes up automatically turn off the lights and raise the shades. 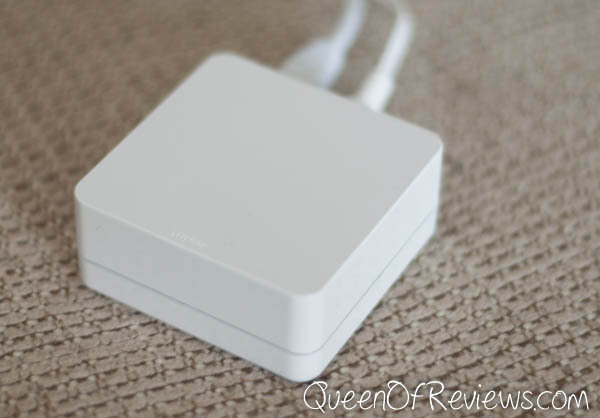 Other awesome products that Caséta works with are Apple Home Kit, Apple Watch, Hunter Ceiling Fans, Sonos, Samsung Smart Things just to name a few, check out the complete list here. It also works with Amazon Alexa and Google Home Assistant. Just say “Hey Alexa, turn on the lights” for example and like magic it happens. Caséta Wireless products are available at many stores near you such as Best Buy, Home Depot, Lowes and also online at Amazon. If your Dad is anything like my husband and is into technology and loves the whole connected home idea he will absolutely love receiving a Caséta Wireless Starter Kit for Father’s Day. Go ahead and pick one up, you still have plenty of time.